Renton Laidlaw Honoured By PGAs Of Europe With ‘Services To Journalism ‘Award’. 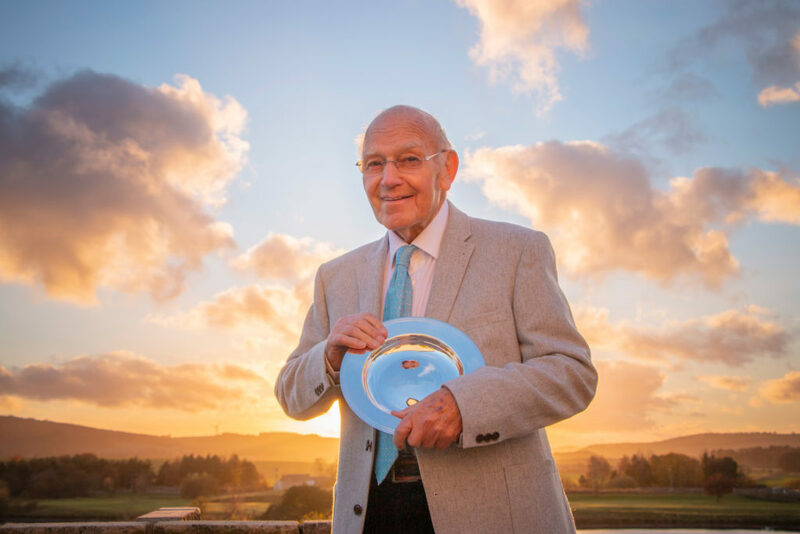 The Association very warmly congratulates and is so proud our former President, Chairman and Secretary, Renton Laidlaw who last month honoured by the 2018 PGAs of Europe Special Recognition Award for his services to, and impact upon, European golf, alongside his friend and colleague, Göran Zachrisson, who also receives the same award this year. And as Renton proudly points out in the You Tube video clip this award competes ‘the set’ as he has previously been honoured by the PGA of America and also the PGA in Britain and now the PGA of Europe. The official press statement stated: With a career in golf commentary, presenting and journalistic reporting that spans over 60 years, Renton has provided the narration for most of golf’s greatest moments across 15 Ryder Cups and 150+ Major Championships, including over 40 Masters Tournaments, seeing first-hand the development of European golf and its players on the world stage. “I’m particularly happy about this award as I’ve spent so much time in Europe covering the European Tour,” said Laidlaw during his acceptance speech shown during at the 2018 Annual Congress Gala Awards Dinner Supported By Rolex at Costa Navarino in Greece. Laidlaw’s journalism career began at the tender age of 14 when he took a job as a copy-taker in a local newsroom in his home city of Edinburgh. Following in the footsteps of his father, he then moved into reporting positions for the Edinburgh Evening News, and into golf after an editor asked him to cover multiple sports. These reporting roles were the springboard for his access to some of the world’s largest golf tournaments in which he had the freedom to pick and choose which events to attend, including his first Major in 1959 at Muirfield where Gary Player claimed his first Major Championship as well. A decade on, having worked in a freelance capacity for Reuters covering golf worldwide, he was then able to change medium having seen the opportunities that lay ahead in television. Initially working for Scottish Television, and later with Grampian TV where he became an evening news anchor, he was recruited by the BBC as a news anchor. By the mid-seventies he was golf reporter for London’s Evening Standard newspaper whilst also taking television and BBC radio assignments on weekends, spending the next 15 years as BBC Radio’s golf correspondent. In the early 90s he was working full-time with British Satellite Broadcasting, which was later taken over by SKY, and by the middle of the decade he broadcast his first European Tour event for The Golf Channel from the Dubai Desert Classic, where he became the mouthpiece for European golf in the United States and brought a European viewpoint to an ever-increasingly global sport. “I’ve been very lucky in that I’ve been able to work in newspapers, write books, in television, and in radio,” added Laidlaw. “To be able to work in all these media is quite something…but I’ve been able to somehow scratch my way through and do them all which makes me, I suppose, a wee-bit unusual. Laidlaw has also played a significant role in golf journalism around the welfare and support of journalists covering the sport through his various roles with the Association of Golf Writers (AGW). He was Secretary of the Association from 1978 – 1995 after which he held the positions of Chairman (1995–98) and President (2004–15) in which he was able to influence the working conditions and support of golf journalists working in the field. His influence has undoubtedly played a key part in helping to foster the successful relationships that exist between the professional and amateur organisations and the men and women of the golfing press. Up until its last publication in 2014, he also edited what is known by many as the ‘golfing bible’ – The R&A Golfer’s Handbook – whilst also authoring many of his own books about the game. After retiring in 2014, he was awarded the 2015 Masters Major Achievement Award in recognition of his coverage of over 40 Masters Tournaments, becoming the first non-American journalist to win the award. This joined a significant list of awards received throughout his incredible career, including the title as first European winner of the PGA of America Lifetime Achievement Award in Journalism in 2003, and the 2012 PGA in Scotland Lifetime Achievement Award.